“Sogda” heat shields are a brand new device (produced by SpecPozh Tech) based on the unique innovative technology of the radical decrease of heat flux. The shields’ know-how and technology are protected by several patents in Russia and abroad, including European patent No. 1181955, dd. 29.09.2004. The “Sogda” shields provide a 50-times heat flux reduction due to thermophysical and optical effects. The shields are intended to withstand heat flux densities of up to 60 kW/m2* and allow the user to localize the flame with a temperature of up to 12000C. *maximum allowable value of the heat flow for firefighters in special clothing without additional protective equipment – 4.2 kW/m2. –Decreasing heat flux no less than 50 times – ensuring equipment and personnel protection from thermal exposure even during large-scale fires; reducing fire extinction time due to cutting down the distance to the combustion source and the more effective use of fire-extinguishing agents; reducing consumption of these agents. –Full protection from open flame – creating the possibility to evacuate people from the fire zone using passages made up of the shields and assembling the fencing to stop the fire spreading. –Unlimited operating time during firefighting – while people and machinery work in extreme thermal conditions and fire exposure conditions. –Providing the visibility of burning objects via the shield – that allows the monitoring of the situation in the fire zone and making quick decisions. “SpecPozhTech” manufactures portable, mobile and stationary shield models. 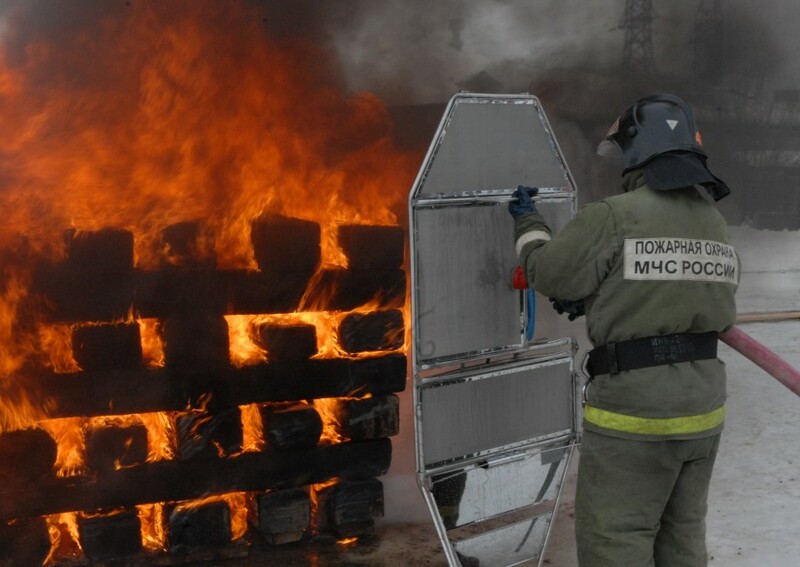 The “Sogda” 1A shield protects a two-man fire crew from large-scale heat flux. Firefighters can fulfill fire extinguishing as well as execute search-and-rescue works. The heat shield is equipped with wheels for it to be displaced. A fire engine or a trailer should be used for transportation of the shields to the fire source. The new model – “Sogda” 1A.01. With this portable shield, firefighters can use both a hand fire nozzle and a portable fire monitor (through a special window in the lower part of the shield). It is placed on stationary carriage hoses at oil-and-gas, fuel, chemical industry enterprises, dumps and other fire-hazardous sites. During a fire, carriage hose operators protected by the shield can stay at their crew station regardless of the extreme heat flows and keep fire extinguishing or cooling down the object until the fire is fully suppressed. This mobile shield is meant for both firefighters protection during fire-extinguishing operations and protecting equipment, buildings and people from thermal radiation. Using the shield protection allows the user to fulfill urgent work on equipment during a fire. The shields permit mounting thermal protection walls or passages for the safe evacuation of people from the fire zone. The shield construction allows the use of both manual firefighting hose nozzles, supplying continual and atomized water jet, and foam generators during fire-extinguishing operations. The heat shield was designed for ensuring thermal protection of people, fire-extinguishing machinery and equipment during operations for eliminating emergencies involving an oil and gas gusher. Also, in case of an explosion, they provide mechanical protection of the personnel against possible injuries by fragments of processing equipment. 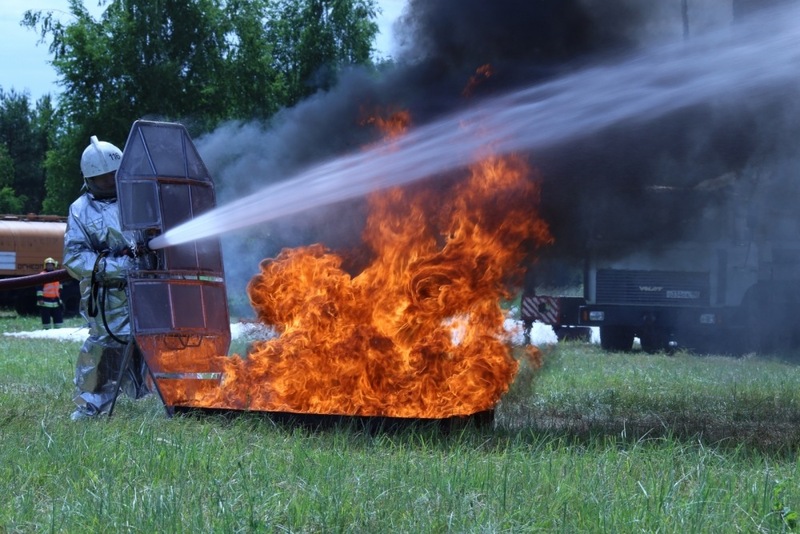 These shields are placed around a burning flowing, whereas the water, supplied via the nozzles, detaches the flame from the wellhead allowing the user to carryout emergency-eliminating operations without resort to echelon protection. 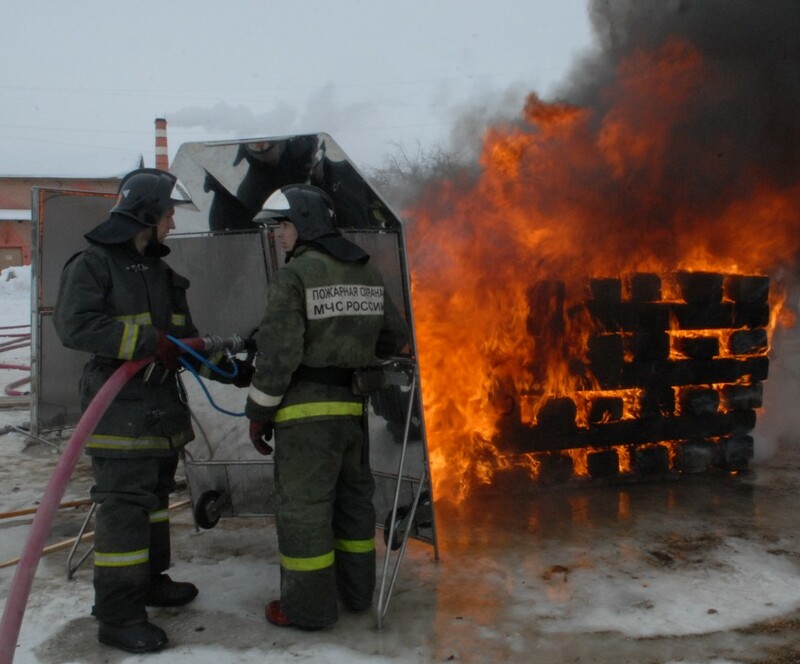 This is a portable foldout shield meant for the individual thermal protection of the firefighter carrying-out his operational activities using a manual firefighting hose nozzle. Its low weight and the compactness of the shield make this protective device the most convenient during fire extinguishing in residential and office buildings and other premises as well as open territory. The shield is transported and stored in a special case. The shield casing easily fits in a fire-fighting vehicle compartment and, if needed, can be transported on the rear seat or in a car baggage compartment. It is meant for allocating and extinguishing the flame base in its initial stage by the personnel of a fire-hazardous facility (e.g. gas filling station) prior to fire brigade arrival. 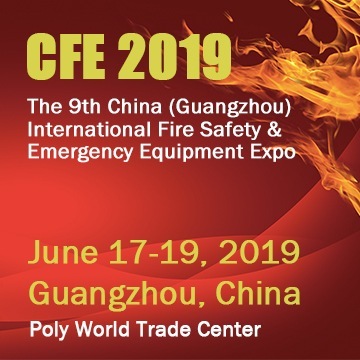 It is equipped with a thermal protection shield and the required primary fire-fighting equipment (fire extinguishers, a hook, a felt mat, etc.). 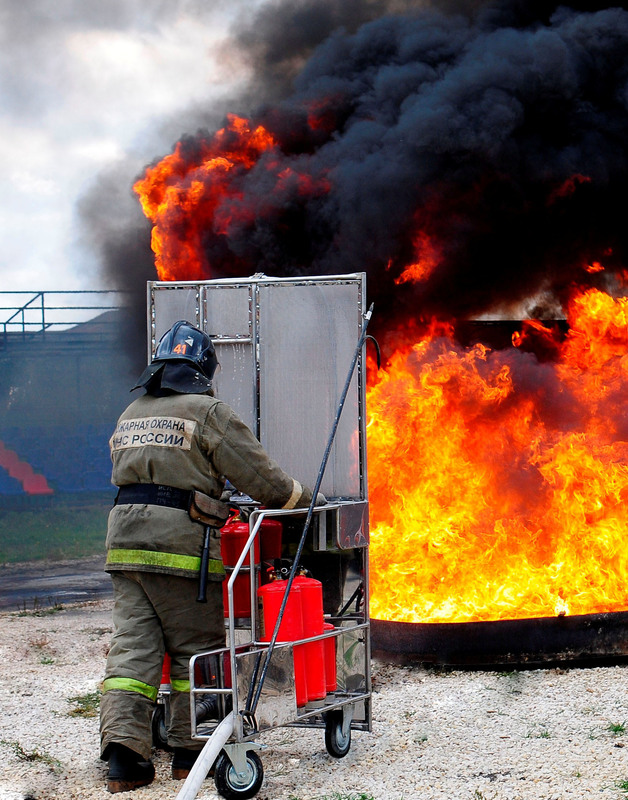 The shield can work with water from an outer water-supply source (via a fire-hose) or can be operated in a free running mode. allow flame localization with temperature up to 1800°C, withstand heat fluxes above 220 kW/m2 and reduce heat flux levels more than 50 times. 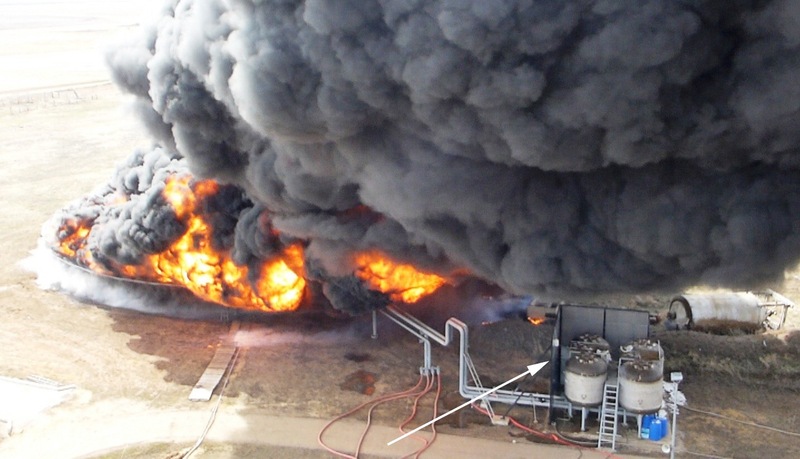 Barriers have been tested to protect tanks with liquefied natural gas (LNG) as well as for fire protection of tanks for petroleum derivative with capacity up to 20,000 m3. Protect tanks with LNG and liquefied petroleum gas (LPG). In the common normal mode, mesh panels are ventilated and, in case of a small leakage, gases don’t accumulate up to an explosive concentration. In case of fire, water sprays the mesh panels and forms water films which block heat fluxes and provide self-extinguishing. Don’t get destroyed in case of explosions as the explosive wave passes through the mesh. Water films are formed again owing to sprayed water and heat barriers continuously protect from fire. Are able to divide the indoor area on fire compartments. Shorten distances between fire hazardous objects. Essential on offshore oil and gas platforms, ships. Safety zones for personnel or passengers can be assembled using fire barriers. Applicable for fire protection of tanks with petroleum derivatives (are able to protect containers with fire-extinguishing agents). In case of LNG inflammation, it localizes flames with a temperature up to 1800°C, withstands heat flows over 220kW/m2 and reduces these flows more than 50 times. In case of an accidental gas leak, it prevents gas accumulation to its explosive limit concentration and protects from a large-scale emergency. In case of a gas explosion, this device does not get destroyed as the blast wave passes through the mesh panels, and thus all fire properties of the device are preserved. One of the main tasks of the fire monitor operator during large fires in the reservoirs is to cool down the equipment to prevent it from fire. In this case, thermal protection like the “Sogda” 2A heat shield is not enough, because the monitor can be directed away from the fire, and the operator is not protected from thermal injury. This problem can be solved by using “Sogda” heat protecting panels, mounted on fire towers. The panels are hung and fixed to the rail/walling bracket or can be moved with travel guides. To protect himself, the operator moves the panel easily, depending on the direction of the heat flow. Firefighters on a fire motor ladder or a lift are protected in a similar way. The panels protect the firefighter who approaches the fire source (such as a burning apartment). 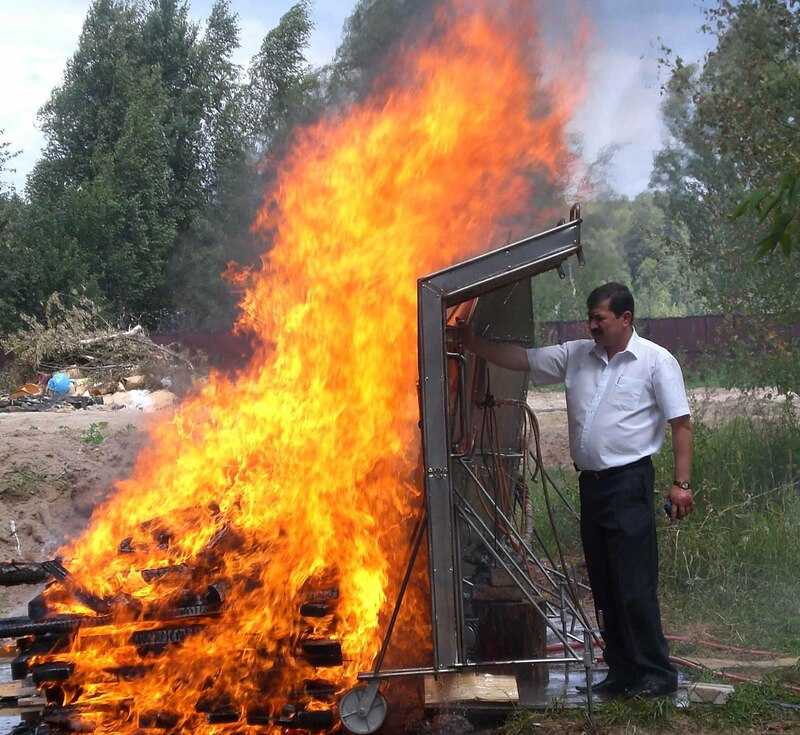 The panels can be easily moved, allowing the firefighter to penetrate into the premises or evacuate the victims. The number of panels on towers and fire cradles may vary depending on the tasks and other conditions.